Three weeks ago, I sent out my DNA sample for alcohol-flush testing. The result has now been available online. As you can see, I am a hetero carrier. 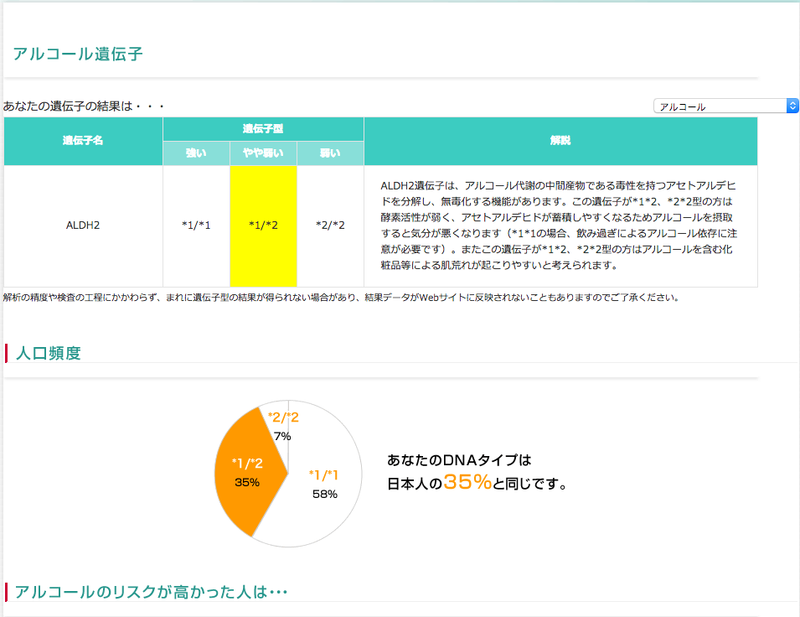 Genelife's explanation is clear enough and there is a pie graph for the frequency of each genotype in the Japanese population. The frequencies are almost same with the HapMap data [rs671] and leads me to wonder whether this is their own in-house data or they just took it from HapMap. As a comparison, below is the result from 23andMe, where I did the genetic testing a couple of years ago in the United States. I personally think the result from 23andMe is more professional - for example, it uses A/G instead of *1/*2 and they also show the confidence level. In addition, it mentions that ADH1B is also important for the alcohol tolerance. However, 23andMe did not provide the population frequency data, which might be related with ethical concerns given by the fact the trait data and disease relate information is banned by FDA since Dec 2013.